Pâte de Verre (pronounced as paht duh ver) French translation “pastes of glass”. I work predominantly in Pâte de Verre glass. 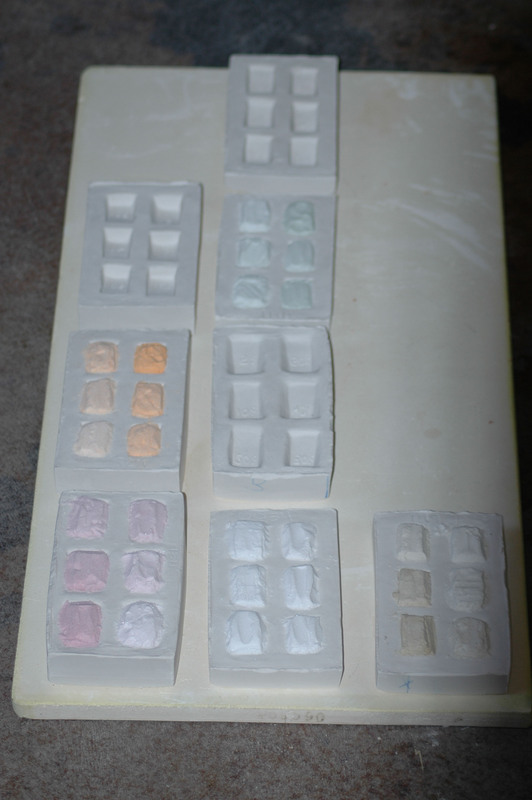 I use clay to create a model, use a refractory mold that I can then use glass powders and frits the size of sand and a glue binder. The glues artists use vary from rice wall paper paste, gum arabic or CMC (carboxyl methal cellulose). Pâte de Verre is a reverse painted process and creating custom color is an important part of the process. Many works are thin walled so light can add a glow. Pâte de Verre sculpture can be thin or solid cast. Every kiln is different but there are steps to firing that move the kiln controller slowly (125° F/hr) through physical bound water then to chemical bound water (350° F) up to quartz inversion (1,000° F) the holds relate to the size of your piece and the thickness of the mold and can be 6+/- hours to 1 hour at 1,000°F. Cracked molds are often the result of not being held long enough, poor mixing of plaster (too thin or too thick) for the plaster to water ratio. How you apply the plaster creates another dynamic to the mold’s structural integrity.